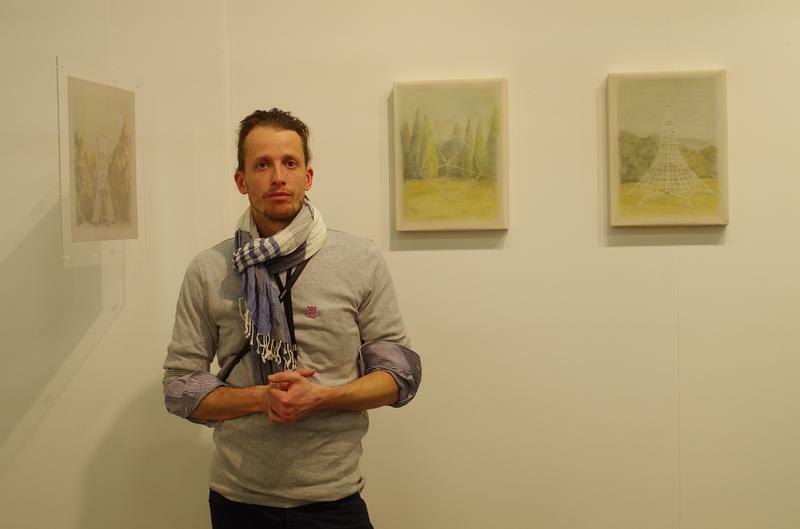 Péter Mátyási is a young Hungarian artist who has just made his debut participation at the international scene at Ani Molnár 's booth at The Armory Show. We talked about his semi-fictitious works inspired by his urban lifestyle and the unique techniques and materials he uses and his impressions about his very first international appearance. Péter Mátyási: This is the first time I have left Europe, so it’s a very special feeling already from a personal point of view, and of course it is even more special being here as an artist whose works are exhibited at The Armory Show. If you hear the name The Armory, a lot of things come to your mind, a lot of established and acknowledged artists, and it is a bit unbelievable to be here as an artist who exhibits first time abroad. I still need to digest this brand new feeling as in the last days we have been very busy and I think I will only be able internalise it when I arrive back to Budapest. TK: And from a professional point of view? PM: This has been by far the most important milestone in my life as an artist. The show has just started, I have kind of a stage fever of course, but there has already been a big interest for my works, which is really reassuring. TK: How and when did you start the cooperation with Ani Molnár? PM: I met Ani after our group exhibition called ’Budapest Jam’ with Anita Kroó and Zsolt Varga in the Studio of Young Artists’ Association in October 2013 where we started to speak about some kind of a collaboration. Next summer she visited me in my studio and we talked about my future representation by her gallery. This was the first time we talked about The Armory Show as a distant plan, and a show in the gallery in Budapest. Both were realised as I recently had a duo show with Attila Kondor, ‘Depicted Time’, in the gallery and now I am here. TK: If we look at your works here or those who know your works for a longer time might formulate the question: how have all these buildings and construction elements “ended up“ on your canvas? PM: Architecture as such came to my focus from the sheer fact that I use a bike wherever I go in Budapest and I am quite positive that this is the best way you learn about a city and become familiar with all its buildings and all the minor either structural or decorative elements like rails, facades, snow repellents. All these urban encounters started to thematise my works. Already back in the university I looked for structures, patterns and rhythm, though my master Sándor Molnár was more into anthropological forms. I used perspectives, lines, cubes, so simple structures in my first (wood panel) painting series and this is what I have used here in this folia series. In 2014 in the group show ‘Street View’ in Labor Budapest I used existing elements like lookout points and documentary photos /of the late '80s/. The curator of the show Júlia Salamon draw my attention to the works of Bernd and Hilla Becher whose photos we have just seen at the Bruce Silverstein Gallery’s booth! They also focused on industrial buildings and showed them in a very minimalist way. Urban landscapes are really good ways to learn about a city’s structure and are points of orientation to such an extent that as we know Goethe had come to know Rome through Piranesi'sprints. The first time I used a real edifice was when I depicted the lookout tower of Balatonboglár or when I used the structural elements of the roller coaster in the former Fun Fair of Budapest. TK: Are these spaces and edifices shown here more of fiction or based on real ones? PM: They are concrete edifices, but in a partly fictional environment. I made a series depicting playground elements dating from the ’80s which was built from very vivid memories from my childhood, that is why I installed them hanging from the ceiling between two layers of perspex. As for the lookout tower series I have no personal memories of actual towers, just the common memory of what it feels like being in a lookout tower. All the basic photos that are used are from the internet, and the most interesting part of the work is how it starts to develop into personal during the work. Regarding the arena series I have personal memories too, but it is as significant as the actuality of the buildings as they really reflect the “Zeitgeist”. TK: Initially you worked with acrylic on wood, or on canvas but lately you have been working with a very special material and technique. How did you start using this technology and what exactly is the method of making them? PM: In 2013 I simply had no money to buy new canvases nor paint… what I had was a roll of drafting film in my studio. In my paintings I very frequently used masking tapes and that is what I did on the film, too. This is how it goes: I build a structure of thin masking tape lines, then rubbing the graphite on the surface, then remove the tapes. The whole technology was of something very interesting for me. Later I changed the method and rub the film first, and than erased the lines next to a ruler with a sharpened eraser. That is the basic technique, but small changes come day by day, like using colours, and using both side of the film… there are still a lot of opportunities in this technique. It is important to mention that the structure is added to my works by using an eraser as mentioned above, and I also wanted to emphasise the human presence in my works even if humans are not visible in the pictures by titling the pieces of the Arena series according to the number of visitor capacity of each. TK: You are here at the fair in person, and we have met at some other art fairs as visitors already: How important is for contemporary artists to follow art fairs and the global trends in general? Why do you think is our region underrepresented in the international art scene? PM: First I hesitated whether I should come, but somewhat later we talked about it with Ani Molnàr and she told me this trip would be very good for me as an artist and I realised that this is the big opportunity for me to visit N.Y.C. let alone at the time when my works are exposed at The Armory as one of the few artists from the Eastern part of Europe. I think it is really important for artists to visit art fairs in order to see what is going on in the art world. I have already been to a couple of art fairs as a visitor and I am planning to regularly visit them. Viennafair is within easy reach from Budapest, but the farther ones are financially more challenging. For the second part of the question I can only say that a lot of things depend on the galleries as they have the real possibilities to represent Hungarian artists abroad and I have a big luck with Ani Molnár Gallery as it has a strong presence at important art fairs.